WHERE Nederlander Theatre, 208 W. 41st St.
BOTTOM LINE Not sharp enough to be so silly. It’s possible to imagine a mood that may only be satisfied by a couple of hours of watching really good performers having a lark with really bad material. It is harder, however, to guess why “Disaster!,” an intentionally tacky and silly hit in a cabaret several years ago, would stretch its amiable cheese-ball foolishness into a Broadway theater at no-joke prices. To fault the show for lacking substance would be as nonsensical as expecting “Mamma Mia!” to be thought-provoking. And yet, given the flock of genuine experts who signed on for the spree, it does seem fair to expect more than this sporadically clever, sweetly produced, fantastically performed spoof of a passe genre — the ’70s disaster movie — in overdone jukebox musical style. Of course, the jukebox from which co-creators Seth Rudetsky and director Jack Plotnick shop is especially rich with embarrassingly beloved and treacly hits from the disco-and-weeper era, shoehorned in with winking lead-ins. Think “Feelings” emoted by three disparate characters in separate spotlights. “Hot Stuff” as an ensemble number for customers and caterers at the opening night of a floating casino built on a Manhattan fault-line. “Knock Three Times” from survivors trapped in remnants of the wreck after the earthquake/tidal wave/inferno. For all the star names, the two breakthrough performances come from less familiar actors — Jennifer Simard, finding freshness in the idea of a gambling nun, and the terrific young Baylee Littrell switching characters with gleeful aplomb as boy-and-girl twins. 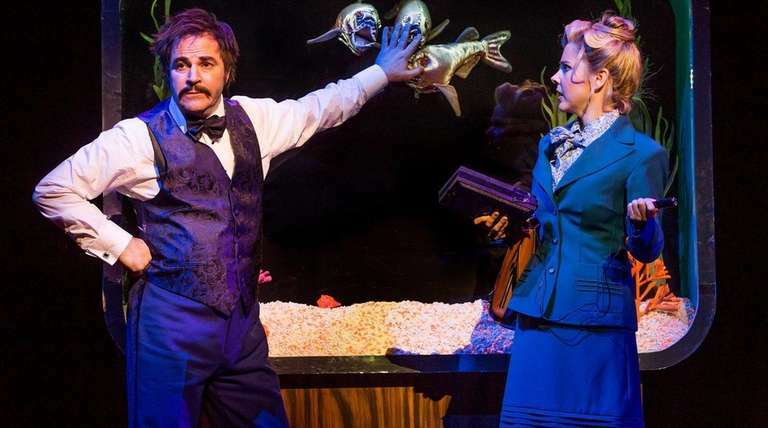 William Ivey Long’s costumes manage to be both funny and beautiful, though Tobin Ost’s sets seem so devoted to the poor-man’s Vegas style that the special effects go for modest imagination over wow. I can’t believe I’m saying this, but we could have used some wow.